Thankyou Archbishop for the Truth that you have spoken. May God continue to bless you and give you strength and courage to fight the good fight, particularly when in the den of wolves and cowards. I pray that St Michael accompany you and the other good men of the synod to stand/fight for the real Truth of our faith. Bravo! 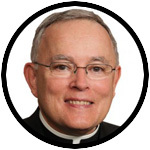 Archbishop Chaput and God bless you. Thank you Archbishop. Without this guiding star of the theology of our bodies – St. John Paul II’s epic masterwork – we will miss those foundational anthropological truths that tell us where we came from, where we are, and where the sign of the body is pointing us. Thank you for your clarity and courage in pointing this out. Outstanding perception of potential synodal problems. Thank you very much for this intervention. I am a 34 year-old Catholic woman, the eldest of nine siblings, hunting prayerfully for my spouse (I figure he’s working just as hard at finding me and we’re just barely missing each other like ships in the night). I can sympathize with those who find the Church’s teaching on sexuality to be hard to live out—it’s not easy to withstand the social pressure of those who tell you to stop being a prude and to have “fun” while you’re still young—and there’s regular fallen nature to contend with, at the same time. Even so, I have treasured the Church’s clear voice and consistent teaching on human sexuality throughout the ages. We’re beautifully and wonderfully made, and misuse of any of our faculties damages that beauty with a heavy cost to our emotional, physical and spiritual integrity. So many in my generation have been lied to about the humanity of unborn children in the womb (they’ve been told babies are only tissue until they’re born… unless the mother wants them in which case they are human throughout every stage of the pregnancy), the reality of suffering and death (with mind-numbing drugs and euthanasia proposed to avoid witnessing or experiencing these realities as much as possible), and the nature of the family. The Church has a divine commission to proclaim the truth, in season and out of season. She cannot lie and must not omit the teachings on human sexuality simply because so many do not wish to hear them. I am therefore, as I said at the outset, deeply grateful for your intervention. I will continue to pray for you and all priests and bishops that we may eradicate the spiritually lax and sexually perverse tendencies that are causing so much pain in the Church. God bless you.